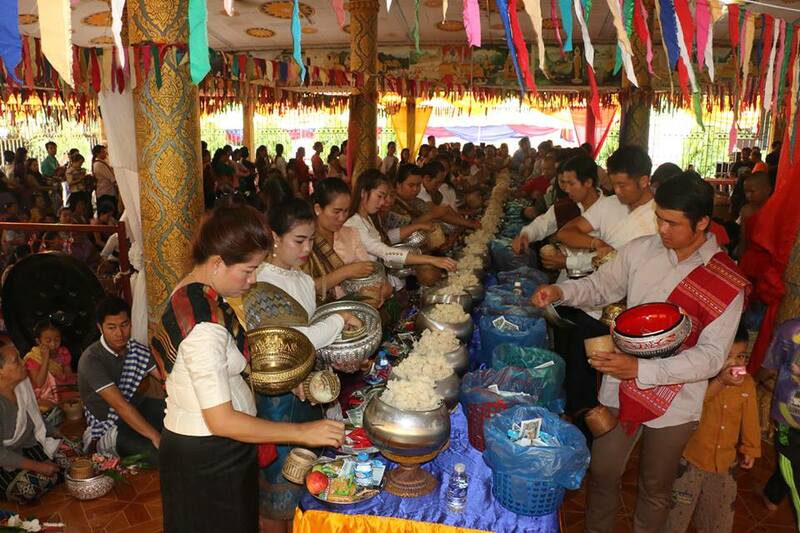 Despite rain falling in many parts of the country including the capital, on Saturday morning millions of people still came out of their homes to temples for alms giving ceremonies. During the morning of the first day to mark Buddhist Lent people practiced takbaat in order to make merit which saw many presenting offerings, white robes, candles, etc to monks in the belief that their departed relatives will receive all the offerings. After completing the morning’s activities, many families travelled to tourist sites for picnics while some organised a party with their family members, relatives or friends. Some people also say it marks the start of a three month period of refraining from drinking alcohol. A stop to drinking will not only save your health, but could also reduce road accidents, and this campaign can be seen on advertising signs along roads in Vientiane and some provinces. According to the latest report from the Traffic Police Department of Ministry of Public Security there were 563 people killed in road accidents around the country in the first six months of this year, with most of the crashes attributed to drunk driving. The statistics show that nearly 100 people died from road accidents each month. On Saturday evening some temples downtown and on the outskirts of the city saw only small numbers gathering for the candle-lit processions due to the rain. According to Buddhist teachings, KhaoPhansa means to remain in one place during the rainy season (monks always recite their vows to themselves in the evening after prayer on the day after festival day) and Phansarepresents the time period of the whole duration. Buddhist Lent or KhaoPhansa is a period of three lunar months during the rainy season when monks are required to remain in one particular place or Vat (temple). During KhaoPhansa monks and novices have to stay and practice all routines and principles over the whole three months such as waking up at 4am daily for prayers, doing longer meditation, and learning and instructing more teachings of the Buddha.